The New Focus ST Mk3 just got better. Fully N.Ring spec tested ! 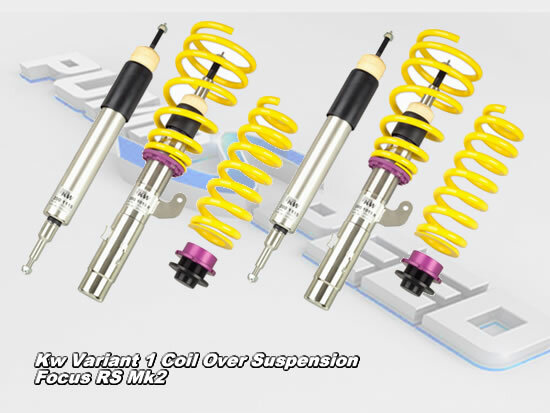 Fantastic Value full specification Ford Focus ST mk3 coil over suspension by the Masters at KW. Pumspeed used the Original Variant 3 (Full damping adjustable) system on their 2009 specification 365bhp Focus RS mk2. But now with release of the new Variant 3 (Variable Damping) system Pumaspeed have taken the desicsion to fit their new ST310 bhp Mk3 Focus ST with the latest KW suspension offering. Many customers that have driven the 2010 spec 425bhp Pumaspeed Focus RS Mk2 have be amazed at the transformation this simple bolt on kit has made to the handling. Comments such as ' Smooth', 'Effortless', 'Precise' have been very common at the pumaspeed workshops. The Pumaspeed Workshop team are ready to fit the KW Variant 3 Coil Over Suspension kit - Focus mk3 ST250 in our Head Office located here. We estimate the labour time to be approximately 3.00 hour(s) costing £234.00 inc VAT. Therefore making parts and labour a total cost £1,851.90 (inc. VAT). Pumaspeed have a specialist distribution team that can dispatch the KW Variant 3 Coil Over Suspension kit - Focus mk3 ST250 to any destination worldwide.